The beginning U.S. dates of the World on Fire tour came to an end in the heart of America in Dallas, Texas. Fans from all countries and states found themselves lined up early in the morning despite the weather to be packed into the Southside Ballroom to catch the final show. Ending with three dates in Texas Slash, Myles Kennedy, and the Conspirators recent tour covered fourteen states and included the spots in some of America’s best rock festivals like Rock on The Range, Welcome to Rockville, and New Jersey’s finest MMRBQ. With a couple off days, the band will soon expand the tour overseas and into seventeen countries. What first started with a solo album from Slash, expanded into a full band of touring musicians who put on a killer two hour show. This tour is in support of Slash’s third solo album, entitled after the single, “World on Fire”. The album made the top ten charts world-wide and has received much air play throughout rock stations. This is the second album which features The Conspirators: bassist Todd Kerns, drummer Brent Fitz, and touring rhythm guitarist Frank Sidoris. Both Kerns and Fitz, recorded on the album and joined on for another tour. While the ticket and marquee says Slash, make no mistake, the five members of the band are a team of talented musicians who make the show unforgettable. What makes these shows so unique is the perfect balance between Guns N’ Roses songs, Slash songs, and intertwining guitar solo’s to create the mystic and essence of a Slash show. You get the best of both worlds with powerhouse vocalist and skilled guitarist, Myles Kennedy who has a dynamic vocal ability to cover such a large range of songs. The show opens with the hit single You’re A Lie off the previous album, Apocalyptic Love. Kicking it into high gear right away, Night Train begins and Slash jumps and runs all over the stage, blaring out solo’s. For the many fans who follow the tour, it’s nice to see the band changes up the next few songs in the setlist a bit each night. Off the new record, Avalon and Wicked Stone get played with fans fist pumping and screaming the lyrics back. The newer songs fit well with the set with them having the distinct rock and roll sound that only Slash can make. It’s not just the typical Guns N Roses that get played, but the underrated Double Talkin’ Jive makes an appearance into the setlist. 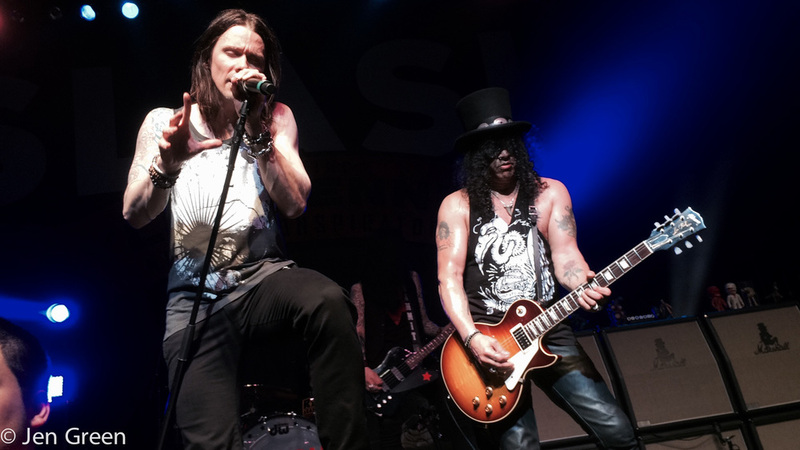 Myles Kennedy, Slash, and Frank Sidoris all jam together on guitar leaving the crowd in awe. Keeping the crowd engaged with the classics, You Could be Mine follows. Look no further for a band full of skilled musicians, bassist Todd Kern’s steps up to the plate with his chance to show his talents on stage. While he typically does backing vocals, he's fit to be a lead singer. The stage is all his for a couple songs where he can show his vocal abilities. Kern’s sings, Welcome To The Jungle and Dr Alibi, a song written by Slash and Motorhead’s Lemmy Kilmister. DONATE NOW: http://ifaw.org/ivory - Iconic rock guitarist Slash and singer Myles Kennedy composed this song to help IFAW stop the needless slaughter of elephants for their ivory tusks and raise awareness of the global elephant crisis. Rocket Queen begins and Slash takes center stage and kicks out a savvy ten minute solo, his hands running up and down the neck of his guitar. This is one of the songs that has stood the test of time and only get’s better as the years go on. Bent to Fly is a song about “coming of age”, says Myles Kennedy to the crowd. The lyrically driven, deeper meaning touches the crowd. It may come off as a ballad but has a nice bite to it, and is absolutely beautiful live. Adding more to the new songs, World on Fire begins as Kennedy leads the fans into a melodic sing-along. The energetic performance perfectly encompasses what it’s like to be at a Slash show. A double-neck guitar is placed into Slash’s hands as he picks out the first few lines to the fan-favorite Anastasia, as the crowd erupts. Myles Kennedy joins on guitar while the three guitarist rip through the song. In true Slash fashion, the gold top Les Paul is on stage, Kern’s blows his whistle, and Sweet Child of Mine begins. 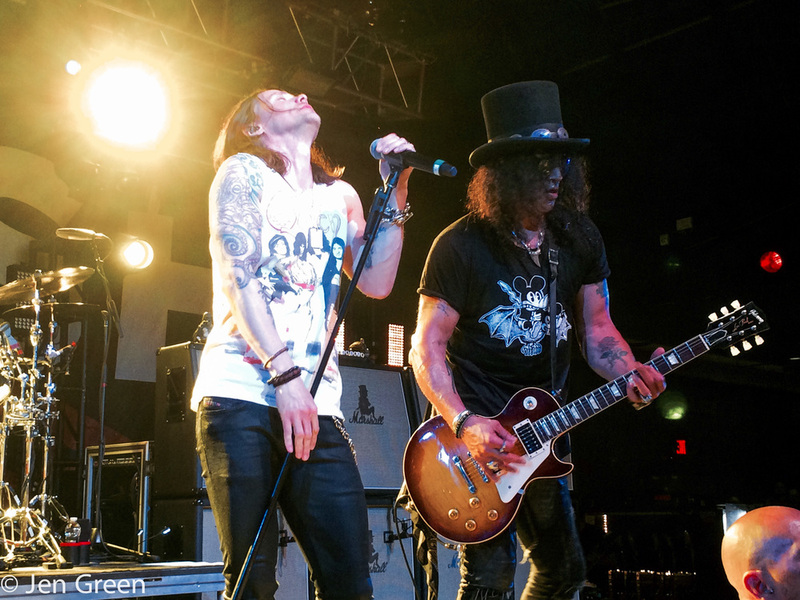 The tour does not fail to forget about another of Slash’s works, Velvet Revolver. The deep bass line leads band introductions and the guitar kicks in for Slither. The band thanks the crowd and says their goodbye only to quickly join the stage again for a final song. One of the most recognizable guitar tunes begins with the chords from Paradise City and the crowd clapping in sync. Confetti blast into the air with the venue soon being filled with shiny red and white rectangle confetti pieces with SLASH written on it swirling in the air. Slash sets his wailing guitar against the amp and make the final bow. The band made their rounds around to the fans in the front, touching hands, throwing picks and sticks, and showing their gratitude for the years of support. Catch Slash’s World Tour over seas in the upcoming months. Rumors suggest there will be more United States date in the fall so stay in touch at http://slashonline.com/ for an official announcement. Photos are from shows: East Stroudsburg, PA; Sayerville, NJ; New York City, NY; Baltimore, DE; Houston, TX; Dallas, TX.